The last day of Blogtoberfest, and October! Not doing any Halloween things here; very over all the gory images and decorations now. Looking forward to more Christmas decorations and sparkly, glittery things! Another happening around this time of year is the appearance of the first Cicadas. The Greengrocer Cicada below was the first this year. Cute, huh? We went out for breakfast with family this morning and had very delicious Eggs Benedict with smoked salmon. Mmm. The poached eggs were perfect, cutting into them released the yummy golden yolks. Delish! After breakfast, the husbitect and and I indulged in some book shopping. Now that I am really into embroidery, I wanted a good stitch guide, found a perfect one plus another book on shading techniques. I also got the latest Connie Willis novel which I am really looking forward to getting stuck into. It is a sequel, so I have been awaiting this book for a few months. Now it is time to go make some delicious dal. Yum, I can taste it already. I just hope the storm passing over doesn’t cause a blackout before I have finished making dinner! 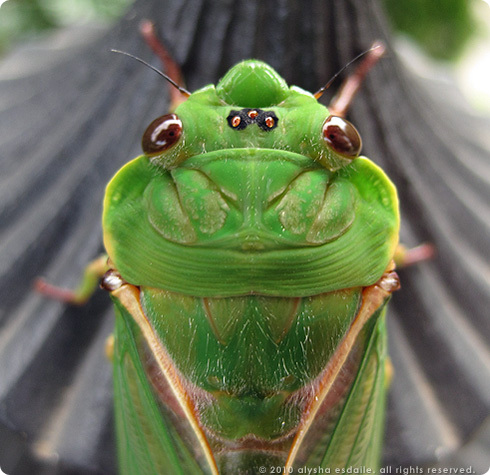 Oh I love your little cicada pic. very cute. Sounds like you have had a wonderful weekend at your place. Hmmmm, craft books, I would love me a few more myself actually. 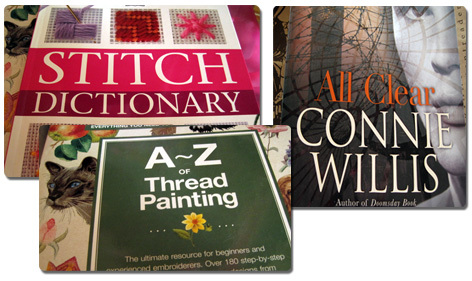 Been cruising the ‘net for craft books lately. Have a great week and I hope that storm just is enough to clear the air for you and do no damage. I have really enjoyed your Blogtober posts!! I love poached eggs too, no surprise I am particular about the way I like them: the yolk cooked on the outside but runny inside!! Yum.